Hi, Good Morning. Thank you friends and viewers. 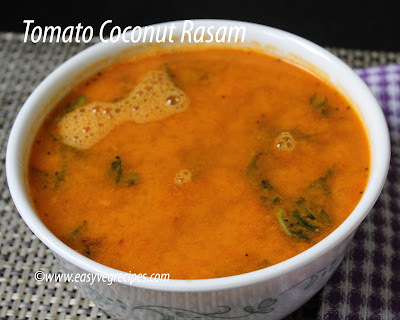 Today I will post how to make tomato coconut rasam recipe. The recipe I have learned it from my mom. It is very easy and simple dish. Here I am posting a video related to this recipe, so that it will be helpful to you. Hope you all liked my videos, please do like, share and subscribe to my channel. Rasam made with tomato and coconut -- good accompaniment for rice. Pressure cook the dal for three whistles and mash and keep it aside. Add tomatoes, coconut and tamarind in a mixer jar. Grind it into a smooth paste. Sieve it and take out the juice. Add salt and turmeric powder and allow this to boil for 5 minutes or till rolling boiling point. Heat oil in a kadai, add mustard seeds, cumin seeds, fenugreek seeds and red chilli. When they crackle, add curry leaves, coriander leaves and asafoetida. When they start spluttering add them to the above rasam. Serve tomato coconut rasam with hot rice. Thank you for visiting my blog. Hope you liked all my recipes. Any feedback and comments are appreciated. For more rasam recipes click here.